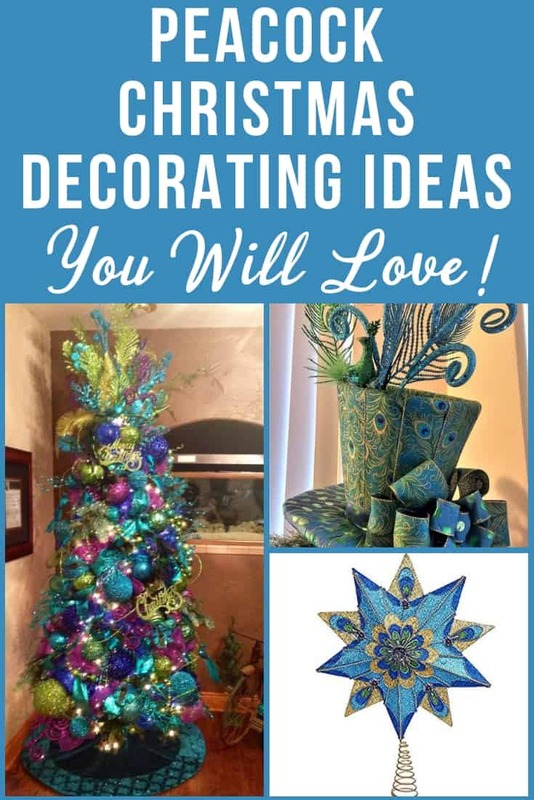 Dazzling Peacock Christmas Tree Decorating Ideas to Brighten Your Home! Are you looking for fantastic peacock Christmas tree decorating ideas? Grab your favorite drink and read on! If you love peacock themed holiday decorations, you’ll want to take your time and enjoy looking at these brilliant ideas for a peacock-themed holiday. Decorating your tree in a peacock theme adds so much brilliant color and elegance to your home. Here are some of my favorite Christmas trees all decked out in vivid peacock colors and ornaments. 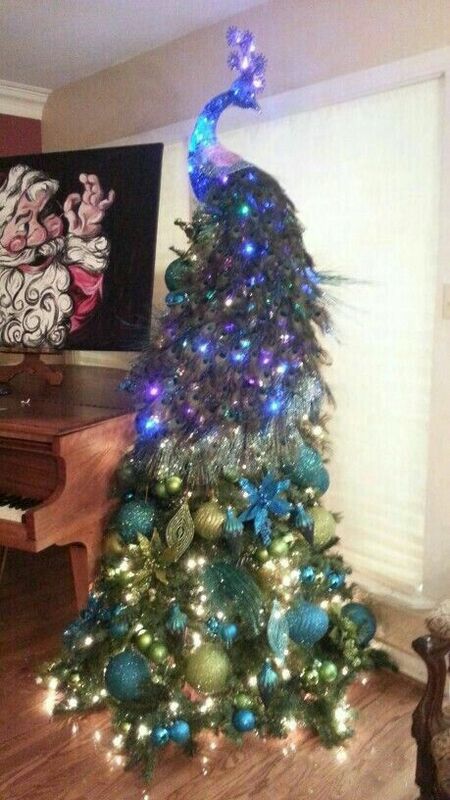 How elegant is this Christmas tree? Don’t you just love the lighted Christmas tree topper? I love the lighted peacock Christmas topper, so I went searching for it online. It turns out that they repurposed an outdoor Christmas decoration into the topper….what a brilliant idea! This is the pre-light decoration that they used as the topper. Unfortunately, it’s out of stock at Amazon and I haven’t been able to find it anywhere online. I also like how they started with purple at the top and then faded into the teal ornaments on the bottom, accented with white lights. Here’s another cute tree that features peacocks. 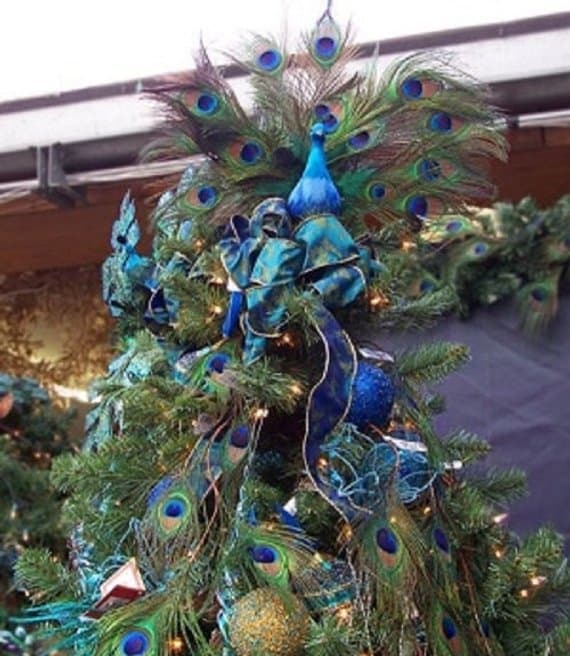 This is a great decorating idea if you want to feature other ornaments on your tree, but still want a peacock theme. In this picture, they simple attached a stuffed peacock to the side of the tree, and then filled in with other ornaments. The feathers are draped across the front of the tree to showcase their color. If your tree is not too large, you might want to use this peacock from Amazon that already comes attached to a clip. I just love the brilliant jeweled tones of this fabulous peacock-themed tree! There’s so much here that you could duplicate at home, from the peacock feathers spread out at the top to the vertical teal and green garland. A show-stopping look anywhere in your home! You don’t need a huge tree to make an impact…this narrow tree has loads of color and eye-catching details! And the elegant tree skirt catches the colors of the tree perfectly. A wonderful look from the top all the way down to the bottom. I haven’t seen that many white Christmas trees, but I love the way the purple and teal colors really “pop” when set against a white tree! They make excellent use of ribbon for Christmas tree garland by overlaying a wired peacock-themed ribbon over a larger tulle ribbon in solid colors. Whether you’re looking to add an ornament or two to your collection, or you’re looking for a complete set of peacock-themed ornaments, you’ll enjoy checking out these lovely Christmas tree ornaments. This glittery blue peacock Christmas tree ornament is my favorite find so far this year! Impressive 13″ long ornament is the perfect choice to add style and color to your tree. And it’s priced at under $20 at Macy’s – before you use any coupons! Want to see more Christmas ornament eye candy? Check out these glamorous ornaments! The rich colors of these detailed peacock feather ball and drop ornaments are a wonderful addition to your themed Christmas tree. Set of 16 shatterproof ornaments are embellished with a swirling peacock feather design and decorated with glittery metal accents for just the perfect amount of sparkle. 16 piece ornament set available at Macy’s. 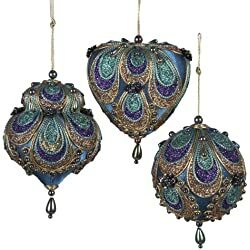 The vibrant jewel tones of this peacock-themed ornament set make wonderful fillers for your Christmas tree. 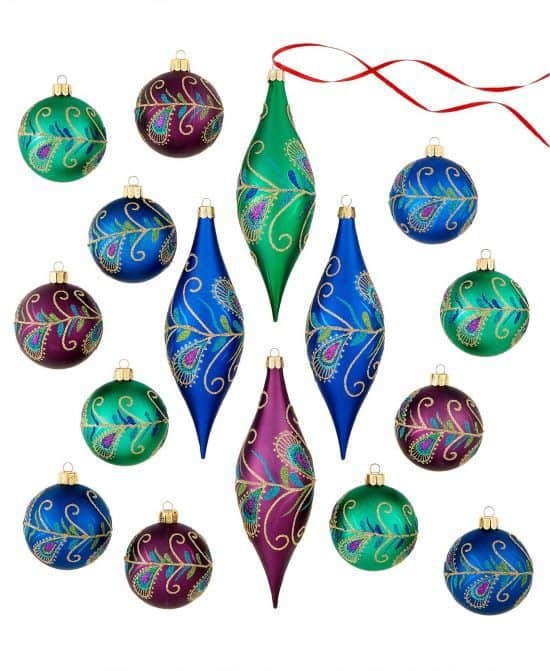 Value pack of 50 shatterproof ornaments features colorful blue, fuchsia, green and gold tones; perfect for matching or enhancing other peacock ornaments. 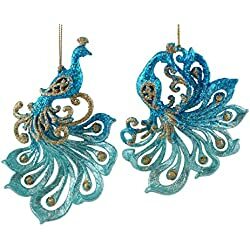 Pack of 50 peacock colored ornaments available at Amazon<. If you love peacock decorations, you really need to check out the gorgeous peacock Christmas ornaments that Toni Scott made from Dollar Tree ornaments. She then decorated the most beautiful mantel – see how in this short video! One of the easiest ways to add a peacock theme to your tree is to add a gorgeous peacock Christmas tree topper. If you can’t find one you like, you can always get creative like they did in the very first photo I showed, where they used an outdoor Christmas light as the topper. Etsy is one of my favorite shops for unique Christmas decor. They feature so many gorgeous hand-made decorations – the type I always wish I were crafty enough to make myself! This stunning peacock topper pictured above is the perfect crowning glory for a glamorous Christmas tree. Peacock Christmas tree topper pictured above at Etsy. Add elegance and style to your tree with this gorgeous star shaped topper by Kurt Adler. Glittery 10-point topper is 16″ tall – perfect for a nice-sized Christmas tree. Some reviewers report that it’s a bit heavy, so you may need to add a little support to keep it upright. Kurt Adler tree topper available on Amazon. This regal peacock would be a show-stopping crowning glory to your peacock-themed tree! Standing an impressive 2 feet tall, the body is covered in blue glitter. 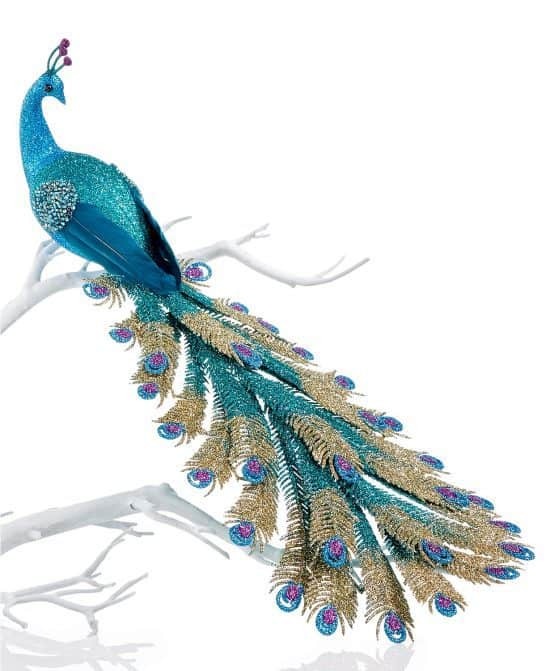 The spread green tail feathers are accented with sparkling blue glitter and glimmering clear gemstones. You’ll have to be a bit creative to attach it to the top of the tree – but I think a bit of wire should handle it quite nicely. Peacock tree topper pictured above available at Amazon. 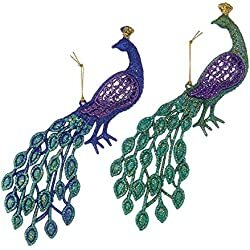 Elegant peacock Christmas tree topper available at Amazon. Add an elegant finishing touch to your decorations by gracefully wrapping a colorful garland around the Christmas tree. The sheer wired ribbon pictured above features a highly glittered peacock plume design that will add the perfect touch of glitz. Peacock wired ribbon above available at Amazon. Why not add a few natural peacock feathers to your tree – they’re perfect for adding height or width, as well as filling in any empty spots. Peacock feathers look especially nice grouped together and fanned out a bit at the top of the tree. Pack of 100 natural peacock feathers available at Amazon. For a truly pulled-together look, don’t stop at just the tree…think underneath! Finish your theme off with a festive Christmas tree skirt that features peacocks or rich, jewel-toned colors to match your Christmas tree. The vibrant teal Christmas tree skirt pictured above is the perfect complement to any peacock-themed tree. It’s available in 2 sizes, so it works well for either a table-top tree or a larger 5-10 foot tree. Click through to Etsy to see the details, such as gold-cord and trim, and the fully reversible gold damask side. 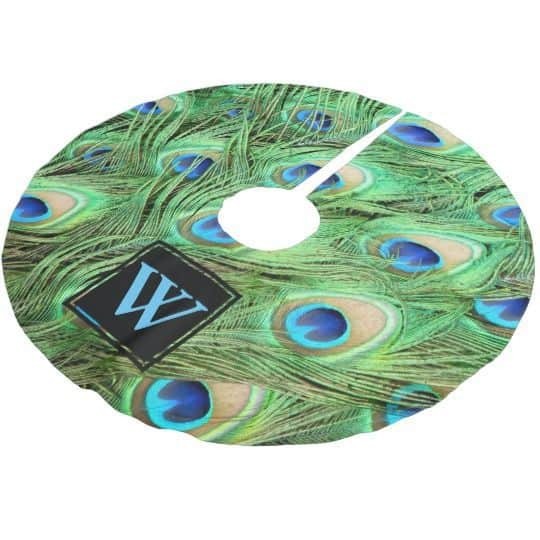 Zazzle has a wonderful collection of over 100 peacock themed Christmas tree skirts, such as the monogrammed one pictured above. Their skirts are 44″ in diameter – perfect for all but the largest Christmas trees. You can also personalize most of the designs with initials or text if you’d like – perfect if you want to create a one-of-a-kind look! Personalized Christmas tree skirt above from Zazzle. Christmas Cocktail Recipes – Festive holiday drink recipes you – and your guests – will love! Elegant Christmas Sweaters – Looking for a dressy holiday top? Find it here! Whole Family Christmas Gift Ideas – Searching for one gift that the whole family will love? Check out these clever gifts! Cute Christmas Sweaters for Women – No ugly sweaters here…a fun collection of casual holiday tops perfect for casual wear.